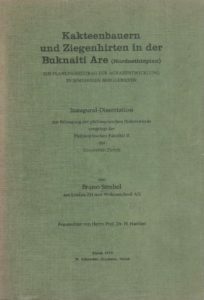 A thesis of Bruno Strebel. Complete title: Kakteenbauern und Ziegenhirten in der Buknaiti Are (Nordäthiopien): ein Planungsbeitrag zur Agrarentwicklung in semiariden Berggebeiten [Cactus farmers and goat herders in the Buknaiti Are (North Ethiopia): a contribution to planning agricultural development in semi-arid mountainous regions], Philosophical Facultu II, University of Zurich. This is the story about how the Irob people picked up a crazy idea and are constructing check dams to create fertile farmland in the stony valleys of Eastern Tigray, Ethiopia. It shows that a long-term cash for work programme can be successful if it leads to tangible results for farmers and strengthens local institutions, local control and the traditional ethic for mutual help. 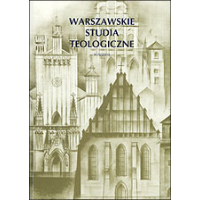 From: Waszawskie Studia Teologiczne XII (2) 1999: 235-239. A mountainous area of northern Tigray, occupied two years ago by Eritrea and recently regained by Ethiopia, has been called a ‘worthless piece of land’ by war reporters, but it is worth a lot to the Irob who call it home. Here, the Irob laboured for years to add value to their land through their own initiative. One of these people is Yohannes Tesfay, a farmer who was so innovative in using stone to conserve land that his neighbours called him ‘The Engineer’. 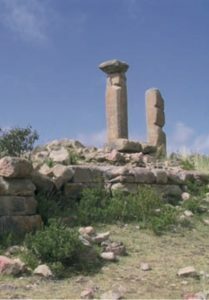 The Eritrea Cultural Assets Rehabilitation Project (CARP), as defined in the Project Appraisal Document of May 2001, is designed to support the Government of Eritrea’s cultural asset rehabilitation and conservation agenda with regard to capacity building, increasing sources of growth, and human resources development. The Cultural Assets Rehabilitation Project is processed as a Learning and Innovation Loan through the World Bank. The project aims to test out and develop means for more fully integrating the conservation and management of Eritrea’s cultural assets into local and national economic development. One of the project priority actions involves the preparation of a community based Management and Implementation Plan for Qohaito. A PhD Dissertation Submitted to The Department of Plant Biology and Biodiversity Management Presented in Partial Fulfillment of the Requirements for the Degree of Doctor of Philosophy (Biology: Botanical Science) Addis Ababa University – Addis Ababa, Ethiopia – June 2015. 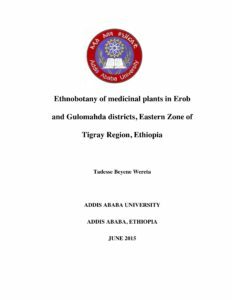 This thesis reports the ethnobotanical study conducted on the medicinal plants, between August 2010 and October 2012, in Erob and Gulomahda districts in Tigray Region of Ethiopia. Ethnobotanical information on plants of local medicinal was gathered through semi-structured interviews involving 382 informants representing different social groups, group discussion, field observation, guided field walk and market survey. A total of 121 medicinal plant species, belonging to 100 genera and 52 families, used to treat 75 human and 27 livestock ailments were documented from both districts. In Erob, 85 plant species in 72 genera and 42 families claimed for treating 58 human and 24 livestock ailments were recorded while 102 medicinal plants in 88 genera and 48 families were documented from Gulomahda, which were claimed to treat 67 human and 18 livestock ailments. The Asteraceae, Solanaceae and Lamiaceae had 11 species each. The herb category was the dominant growth form in the study area. Plant species collected from the wild were the highest in both districts. The most frequently used plant part forpreparation of remedies in both districts was the leaf. The local people of the study districts frequently engage their eloquent proverbs to accentuate the importance of plant species for medicinal purposes including the saying “a drug can kill, and a drug can save”, which survived for generations. 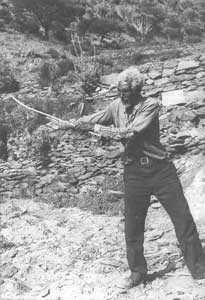 Jaccard’s Coefficient of Similarity of Erob and Gulomahda for the reported traditional medicinal plants was 0.55 indicating some trend of using common plants. The insignificant mean number of plant species used to treat human (p (0.17) > 0.05) and those for livestock ailments (p (0.26) > 0.05) between the two districts showing that the local people usesimilar plant species to cure ailments. The insignificant different of χ2 test for the relation of gender on conservation of traditional medicinal plants in Erob (p (0.27) > 0.05) and Gulomahda (p (0.23) > 0.05) showing that conservation of medicinal plants was not affected by genderdifferences. The computed Pearson’s Correlation Coefficient for the knowledge among differentage levels was 0.84 for Erob and 0.77 for Gulomahda showing a stronger positive (direct) linear relationship between age and knowledge in both districts and this relation was significant in Erob (p (0.00) < 0.05) and Gulomahda (P (0.00) < 0.05). A negative linear relationship for the knowledge among different educational leveles was 0.44 for Erob and 0.47 for Gulomahda indicating modern education affects the knowledge on medicinal plants and the relation was significant in Erob (P (0.00) <0.05) and Gulomahda (P (0.00) < 0.05). The insignificant difference for mean knowledge of medicinal plant between male and female in Erob ( p (0.39) > 0.05) and Gulomahda (p (0.08) > 0.05) indicating that males and females were equally responsible for primary healthcare of the members of their families. The significant difference for mean knowledge between Saho and Tigrigna speakers in Erob (p (0.02) < 0.05) indicating that the mean knowledge of Saho speakers is significantly greater than the mean knowledge of Tigrigna speakers for the reported medicinal plants in this District. The significant difference for the mean knowledge between Catholic and Orthodox followers in Erob (p (0.02) < 0.05) indicating that the mean knowledge for the reported medicinal plants by the Catholic followers) was significantly greater than those of Orthodox followers in this District. There was no widely observed trade on medicinal plants in the markets studied. 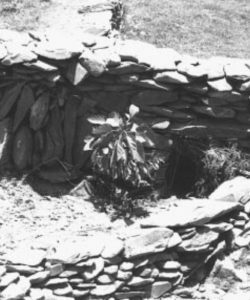 Threats on medicinal plant species included drought, fuel wood collection, construction material extraction and civil unrest while rehabilitation of degraded areas, replanting, homegardening and provision of alternative energy sources are suggested as plausible actions to protect the medicinal plant resources and the associated indigenous knowledge.